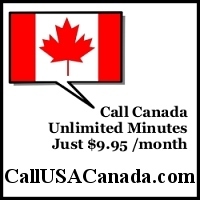 Unlimited Long Distance to Canada Just $9.95 per month! Sign up for our unlimited flat rate calling to Canada, and call Canada from your home, cell, office or any other number. Flat Rate Unlimited Calling to Canada. Call Anywhere in Canada, Home and Mobile. Multiple Phones Per Account (Home, Cell, Office). Pinless Dial for Every Phone You Add. Auto Dialing for 10 Canadian Numbers. Unlimited USA/Canada and International call plans starting from $18.99. No yearly contracts, No signup fee. Make and receive phone calls using our Internet phone service! No need for headphones or a computer! Just pick up a normal touch-tone phone, dial a phone number and start talking. Travel with your Blackberry Pearl almost anywhere in the world for it provides Quad-Band network support on 850/900/1800/1900 MHz GSM/GPRS and EDGE networks to allow for international roaming between North America, Europe and Asia Pacific. Email, web browser, text messaging (SMS and MMS), instant messaging, organizer applications and more. Talk freely up to 3.5 hours. DECT 6.0 digital technology, which provides an unsurpassed range, this expandable phone system comes with 2 handsets, a charger and an answering system. RingCentral Online is a Web-based telephone and fax service for professionals and small businesses. It provides a toll free or local phone number and advanced features not found in traditional phone systems from CDN$ 9.99 per month after 30 day free trial. FREE LONG DISTANCE in Toronto (Canada) Area! Dial the local access number and Listen to only one 10-15 second informative message. Then enter the ten digit number you wish to connect. Click Here for Free Long Distance Calls in Ottawa area. Convergia 4.9 Canadian �/minute direct dial long distance. CogniConference Premiere conference calling with great features at a discount price! CogniCall Post Paid Calling Card with Global Origination and Ultra Low Rates! AccuGlobe Global origination calling card - huge savings! CogniFast Providing Nation Wide dial-up Internet for $9.95 per month. Toll Free ISP low-price, high-quality leader in remote worldwide ISP access. Domains With Us Domain names for only $9.75 per year! Warp Speed Hosting UNIX hosting as low as $9.95/month. Lowest Domain Rates New domain names for only $9.95/year! Simple Biz Hosting Reliable, Affordable and Professional Web Hosting starting at $3.99 per month. Call from anywhere in the world from a computer to a computer or to any phone. Click Here! Submit your email address and receive free calling cards up to 50 minutes long. Click Here!